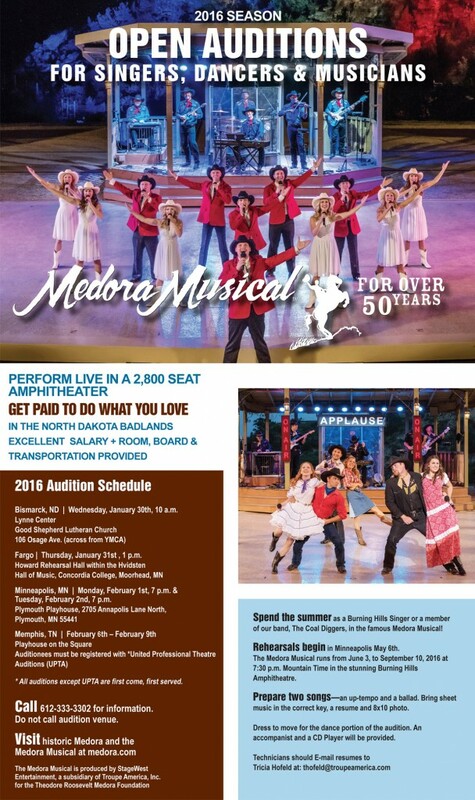 (Medora, ND) – The Theodore Roosevelt Medora Foundation, in conjunction with StageWest Entertainment, is pleased to announce that auditions for the 2016 Season of the Medora Musical are set to begin this weekend for performers interested in trying out for the Burning Hills Singers and Coal Diggers Band. Saturday, January 30, Bismarck, North Dakota, 10am, at the Lynne Center at Good Shepard Lutheran Church. Sunday, January 31, Moorhead, Minnesota, 1pm, at the Howard Rehearsal Hall within the Hvidsten Hall of Music at Concordia College. Monday and Tuesday, February 1 and 2, Minneapolis, Minnesota, 7pm, at the Plymouth Playhouse. *All auditions except UPTA are first come, first served. Members of the media are welcome at audition venues. Representatives fromStageWest Entertainment and the Theodore Roosevelt Medora Foundation, as well as auditionees, may be available for questions and comments. Singers, dancers and musicians are required to prepare an up tempo and a ballad for the audition. Prospective performers should also bring sheet music in the correct key, a resume, and an 8×10 photo. More detail on the poster below.